The AOC Agon AG352UCG6 is an improved version of the AG352UCG with some minor aesthetic refinements and a boosted ultrawide VA panel. The monitor is a great pick at its current price considering its a 35-inch beast that includes Nvidia’s G-Sync technology. The AOC Agon AG352UCG6 doesn’t offer massive improvements over its predecessor, but could it be one of the top ultrawide monitors available today? The AOC Agon AG352UCG6 is one of the flashier ultrawides out there when compared to offerings from LG or Samsung. It’s one of the brand’s models which are treated with gamer-centric design cues, however, we still think its less gaudy than the PG348Q. VA panels are notorious for having thick panel borders, so it isn’t surprising that the firm added reasonably thick bezels to conceal them. Overall, the AOC Agon AG352UCG6 looks very presentable with its extensive use of matte black with subtle red accents. We think the product’s build quality makes it one of the more dependable models out there with its excellent feel and solidity. The device when fully assembled is no featherweight at 26 lbs which makes it one of the heaviest in its category. One thing that’s very noticeable on the AOC Agon AG352UCG6 aside from its weight is its a meaty display when viewed from the sides. The cabinet itself its chunkier than most while the 1800r curve makes it more profound. Some of the AOC Agon AG352UCG6’s physical features add to its mass, starting with the metallic chevron at the rear. This, along with the bottom bezel strip have LED strips which are limited to red, green, and blue with three brightness levels. The add-on is purely decorative, but it can function as bias lighting in dark rooms to increase eye comfort and safety. What we love about the AOC Agon AG352UCG6 is its metal stand, which, again, adds to the weight of the device. But the best thing about it is it keeps the massive monitor steady and planted to your desk all the time, It’s also removable in favor of VESA mounting, plus, its ergonomics include height, tilt, and swivel. 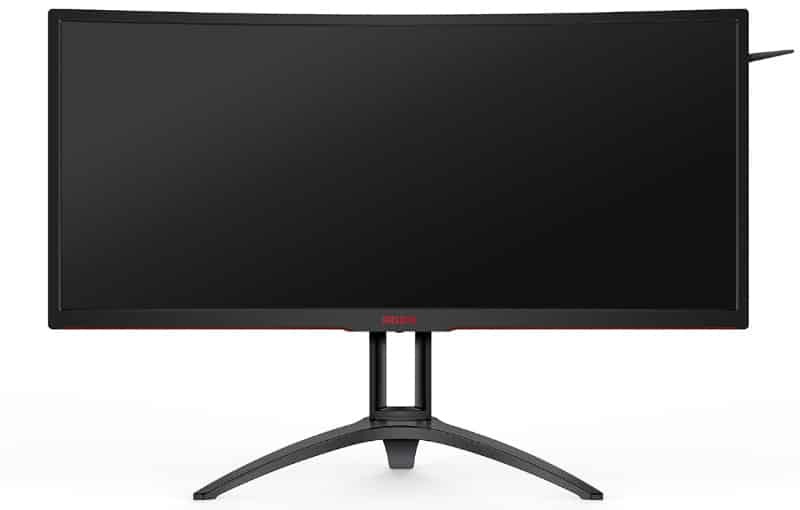 The AOC Agon AG352UCG6 is a full-fledged G-Sync gaming monitor which means it has a proprietary module that will limit its inputs. The split layout includes DisplayPort 1.2 and HDMI 1.4 on one side, while the other half holds a 3.5mm jack and some USB 3.0 ports. There is also a pair of 2-Watt speakers, but they aren’t great in complementing the massive screen. The AOC Agon AG352UCG6 boasts a 35-inch VA panel with a 3440 x 1440 resolution, 120Hz refresh rate, and 4ms response time. Contrast is rated at 2500:1 while the LED backlight has a 300cd/m2 ceiling. The most prominent upgrade of this variation over its predecessor is the added 20Hz refresh rate which can be considered a significant boost at this resolution. The screen’s 1800r curve radius makes it tighter and more engrossing, but some games may look slightly distorted compared to 3200r screens. We think its only a matter of getting the right position and will still look more proportioned than three 16:9 spanned together. There’s also the bonus of not having bezels in between, giving you a single, solid picture that’s horizontally more expansive. The AOC Agon AG352UCG6 covers 115% of the sRGB color space but color accuracy is slightly off due to some extensions in the red spectrum. Calibrating the display can achieve up to a DE of 2.0 which is excellent for a VA panel, but IPS variants like the Acer X34 are still better. The screen looks slightly more reddish than some we have tested, so we recommend dialing in the RGB temps in the OSD if you don’t have a colorimeter. It’s also ideal to reduce the brightness with glows at 340cd/m2 at 100% to raise the contrast ratio and deepen the screen’s black luminance. The AOC Agon AG352UCG6 is capable of 2250:1 if you reduce the backlight to around 30% to 40% and lock in the third Gamma option in the OSD. The latter doesn’t track perfectly, but it doesn’t affect the monitor’s suitability for vibrant or low-lit games. 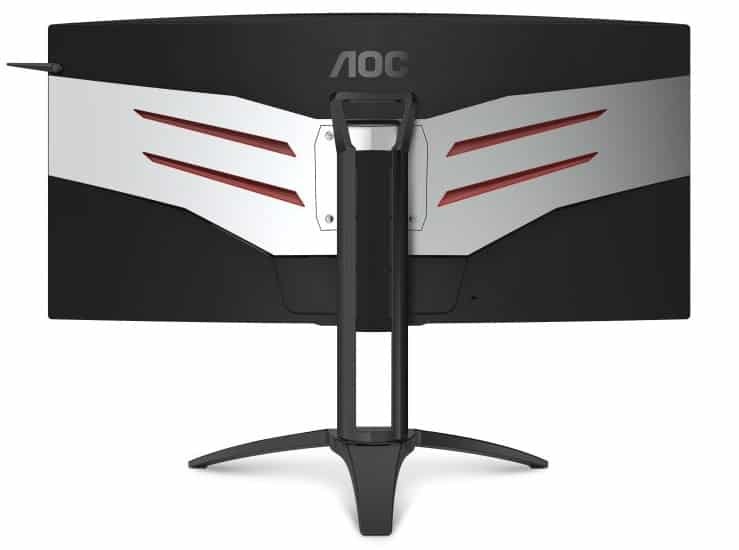 The test unit for the AOC Agon AG352UCG6 showed exceptional panel uniformity for an ultrawide since errors were marginal at the most. The screen’s illumination did not exceed 10% deviation from the center to the sides, plus color variance is limited to DE 3.0. Most users will be hard-pressed to see the difference unless they use a colorimeter and read the results. This combination of imaging qualities enables the AOC Agon AG352UCG6 to look exceedingly good in games like BFV or Apex Legends. The colors are pleasantly solid with excellent depth, while low-light and grayscale performance are rich and well-defined. The monitor also handles motion superbly for a VA model, especially when its overdrive is set to its Medium setting and 120Hz operation is enabled. It also helps that the AOC Agon AG352UCG6 is equipped with G-Sync, making it a perfect pair for the latest RTX cards. You need the top-end 2080 Ti to keep frames consistently close to 120Hz at ultra settings, but tweaking in-game settings will always help FPS stability. Input lag is limited to 6ms at 120Hz, so gamers will not feel any delays or “de-synced” instances from the gaming system. The AOC Agon AG352UCG6 is an excellent choice if you cannot wait for 200Hz ultrawides which have been massively delayed. Gaming at this resolution at 120Hz is still a massive upgrade over typical monitors, and an experience everyone will appreciate. It also helps that the screen is capable of reasonably superb image qualities, although calibration is a necessity. The AOC Agon AG352UCG6 can handle motion better than some counterparts, but it still is a VA monitor. Some blurring is still noticeable in E-Sports titles, so competitive gamers might dislike this model. The aesthetics of the device is also an acquired taste for some, but we consider the monitor a steal at its current retail price for this year.